When I see the local wind farm I feel happy. To me, the towering white turbines are signs of progress, and reason for hope that we will successfully transition to renewable resources, to replace fossil fuels. 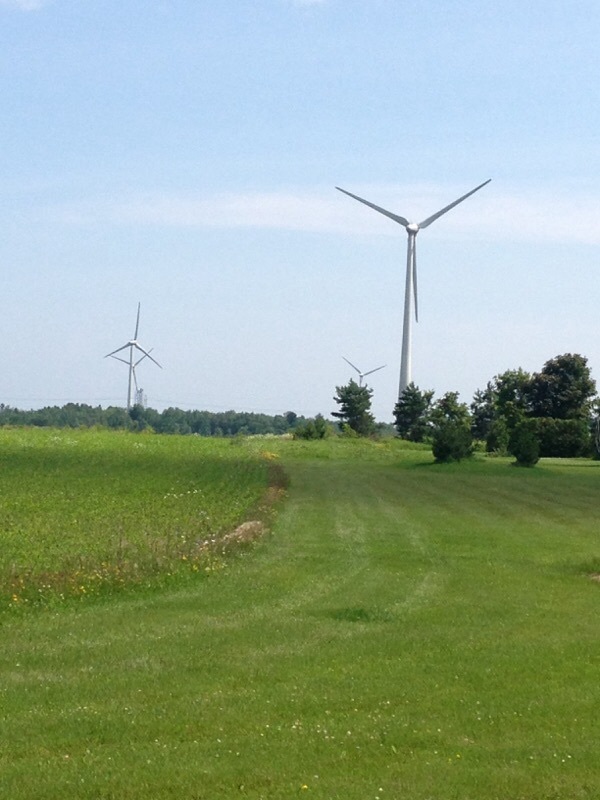 The first photo, taken by me, shows a wind farm in my Ontario, Canada neighborhood. I have added the second and third photos (Getty Images) to depict how wind farms are a global phenomena. The second photo shows turbines in Paracuru, Brazil, at sunset; and the third shows a wind farm in Ayrshire, Scotland. Yes I agree! A lot of people complain about them but I think they are beautiful. Yes there is controversy, especially for those who live nearby. I like seeing them too. I wish I could walk beneath them. Hi — sounds like an idea…there are turbines in a corn field on an island near here in the St Lawrence River..the farmer hosts a corn maze and you can walk right near the turbines. What is interesting is that people can look at a wind turbine and say how it is ruining the landscape (and potentially our health) yet a coal mine, a fracking site or an oil drilling site are acceptable? Give me a windturbine any day.